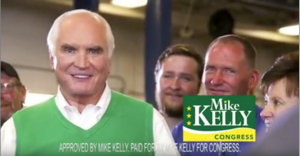 Rep. Mike Kelly (R-Butler) releases his second ad of the general election cycle. This one boasts about his support for the GOP tax reform bill. Kelly believes the GOP tax reform bill is already benefiting the workers of his district. PoliticsPA is seeking comment from Kelly’s Democratic opponent, Ron DiNicola’s campaign. Kelly is the first GOP candidate for Congress in Pennsylvania to release a television ad solely promoting the tax reform. Kelly’s first ad, discussed protecting and preserving Medicare and Social Security. The same week he released his first ad, Rep. Keith Rothfus (R-Allegheny) and Sen. Bob Casey (D-Pennsylvania) put forth television advertisements stressing the importance of protecting senior citizens. Kelly is a disgrace to the 16th district. Why are there so many jump cuts?!? The plastic surgery and botox need to stop. He looks like the Joker from Batman. No one in real life looks or talks like this POS. I feel sorry for the people in the background of this ad. I hope they got paid. He looks like a lying idiot. What is with that smile – they probably had to do about 128 takes and that was a compilation of the best ones. Wow – terrible ad – people aren’t stupid Mike – they know the tax plan is bad for working people. I’m a working person in Western PA and the new tax bill is working great for me and the people I know. That is the working people who are actually working. Either that extra $15 a paycheck (maybe) really goes a long, long way where you are, or you might be stretching the definition of “working person”. Sure, Warren Buffett has a job and is technically a “working person”, but he certainly isn’t working class. While I suppose it is basically their only accomplishment, tying yourself to a bill that only about a third of voters approve of, with steadily dwindling support – it’s a bold strategy, Cotton, let’s see if it pays off. “Robert B. Suckmeoff, M.D.”. Hahahahaha! Lol! You just made my day. We get it! You’re Irish! Lose the sweater vest, partner.